Men’s IFC recruitment is a dynamic system. With two forms of recruitment (formal and informal), the Interfraternity Council (IFC) strives to provide an organized and effective way for a prospective member to become a member of an IFC fraternity at Mizzou. Specifically, the Interfraternity Council has strict policies pertaining to alcohol-free formal and informal recruitment process. Finally, the intended outcomes of formal and informal recruitment are the same: to showcase the values and principles each fraternal organization upholds. Each fraternity has their own core values and both recruitment processes provide an avenue for a prospective member to determine if an IFC fraternity is right for him. Informal Recruitment takes place year-round. Fill out the IFC Informal Recruitment application. If you have any questions, please contact the Office of Fraternity & Sorority Life at 573-882-8291 or email IFCrecruitment@missouri.edu. Check back for updates about our Formal Recruitment Guide! Formal recruitment begins on Wednesday, August 14, 2019 and concludes on Saturday, August 17, 2019. Residence Hall move-in and potential new member orientation kick-off is on Aug. 14, 2019. Open House round on Aug. 15-16, 2019, offers potential new members the opportunity to meet men from all 35 chapters during these two days and learn about what it means to be a member of that specific chapter. Bid Day is Aug. 17, 2019, where chapters offer potential new members invitation to join their brotherhood. Registration for 2019 Formal Recruitment will open May 1, 2019. Registration link TBA. How much does Formal Recruitment cost and what does my fee cover? How does the Formal Recruitment process work? The Formal Recruitment process starts out with an expo that allows Potential New Members to meet representatives from all of our IFC fraternities. The rest of the process is through mutual selection where potential new members (PNMs) will select chapters that they are interested in and chapters will select PNM’s that they determine are the best fit. What is the difference between Formal and Informal Recruitment? Formal Recruitment is run through IFC and allows Potential New Members to meet members from all 30 fraternities in the Fall. 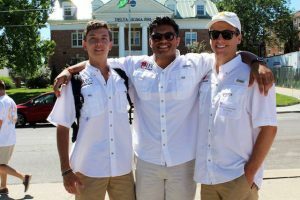 Informal Recruitment can happen at any time and requires the PNM to contact the fraternities directly about their individual recruitment processes. 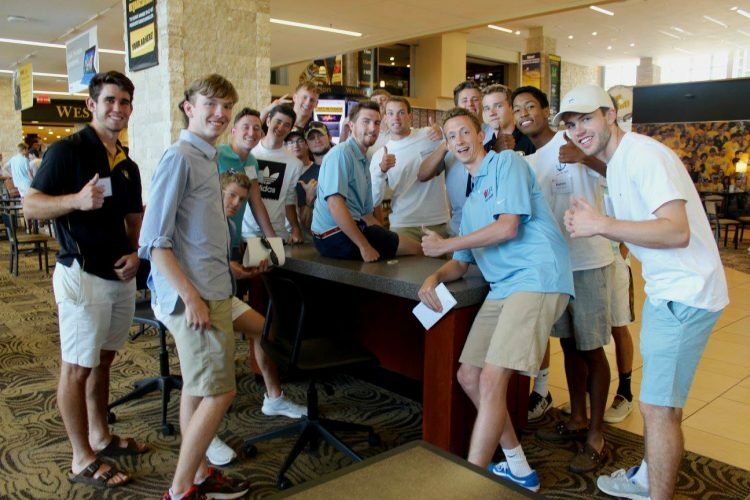 Fraternities often have informal recruitment events throughout the year. A Rho Gamma (PΓ) is a Recruitment/Refinement Guide. A PΓ’s role is to serve the IFC community via Formal Recruitment and Membership Education and Development. The individuals selected for these positions will be trained in many aspects of what it means to be a fraternity man, as well as the Office of Fraternity & Sorority Life and the University at large. The responsibilities of these positions will start in the spring semester and end towards the close of the fall semester, including the summer for Formal Recruitment.